The Pacific Northwest is more than just a marijuana hub–it’s a full-blown cannabis culture. With recreational and medical legalization in Washington and Oregon, cities like Seattle are reaping the rewards of a business poised to permeate the entire country. Seattle budtender jobs and other dispensary positions account for much of the job growth Seattle is experiencing as a result of legalization. 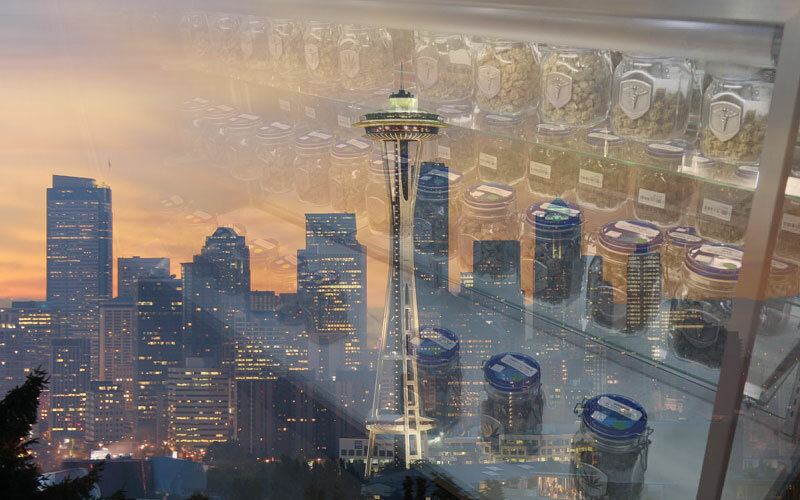 Local marijuana tourism not only strengthens the cannabusiness, but also helps reinforce existing industries, garnering increased revenue opportunities for the Emerald City. Residents and visitors are steadily increasing the demand for cannabis products and helping to establish a competitive market for marijuana dispensaries. It comes as no surprise that a diverse demographic of individuals are passionately seeking employment within Seattle’s marijuana industry, with a distinctive interest in Seattle budtender jobs. The expansive growth of the cannabis industry isn’t just limited to large cities like Seattle either, Washington marijuana jobs can be found across The Evergreen State. So, let’s get some basics out of the way: What is a budtender? Why is there so much interest in this job specifically? Budtenders have a unique position in the marijuana industry, as they facilitate the direct sale of cannabis from dispensaries to patients and customers. Seattle budtender jobs maintain similarities to jobs of the same name in other states with a keen focus on customer service. Marijuana is a consumer driven industry and the budtender’s main responsibility is to satisfy customers and keep them coming back for more. The daily responsibilities of Seattle budtender jobs are numerous and contingent on the needs of each store. With that said, an overarching focus remains on guiding customers successfully through a sale. Budtenders use their time tested knowledge of a wide variety of marijuana strains and other cannabis products to accurately suggest merchandise to fit the individual needs of the customer. Not only are they well versed in the differences between indica, sativa and hybrid flowers, they are able to sequester and explain characteristics of individual strains in flowers, concentrates and edibles. With greater consumer access to cannabis products, budtenders meet expectations of marijuana novices and connoisseurs alike. There are a number of reasons that Seattle budtender jobs require extensive familiarity with merchandise. Largely, medical marijuana patients want to know the cannabinoid content and medical implications of particular products in the dispensary display. It is integral that patients be properly informed on recommended dosages, duration of treatment and psychoactive effects. A great budtender is able to generally assess the ailments of a patient, their preferred method of intake and desired results, in order to select the products most likely to help patients achieve their goal. For instance, if a patient is looking for a more sustained high and doesn’t want to smoke all day, a budtender may recommend an edible with a high concentration of THC. For recreational and medical marijuana customers, there is definite interest in knowing what sort of high a particular product will give you. Budtenders often do research and test merchandise (off-site) to accurately report on the psychoactive effects of the cannabis products. Now that customers are becoming more selective about their products, budtenders utilize their skills in sales and storytelling to pitch products. Industry leading site Leafly has shrewdly taken advantage of consumer desire for information by compiling pages for individual strains, their medical benefits and effects. Even with developments like these, however, it helps to get some first hand advice from someone with experience behind the counter. Even though medical marijuana in Washington state has been legal for years, it can still be difficult to determine exactly what marijuana dispensary employers are looking for applicants for Seattle budtender jobs. Even as we in the industry continue to make sense of legal marijuana sales, there are a few, somewhat standardized qualifications for Seattle marijuana jobs that certainly help to ascend individuals from the giant competitive pool of applicants. It may seem obvious to include cannabis experience as a prerequisite for dispensary work, but it is a topic worth exploring in depth. On the one hand, there are dispensary hiring managers who require a history of hands-on marijuana experience from employees. Due to such an overwhelmingly eager response to working as a budtender, employers can thin the pack by interviewing the most experienced applicants. On the other hand, some managers ask for an extensive knowledge of and passion for cannabis, but do not require experience working with marijuana. Realistically, because of pervasive marijuana prohibition, it is unlikely that many people have legal experience working in the marijuana industry. There’s no getting around the fact that ultimately, experience is king. I have a fair share of contacts in the industry whose consistent work history with marijuana allows them to be employed in virtually every sector of the cannabusiness. These folks often work in the summer in cultivation, trim in the fall and budtend in the colder months. While it can be frustrating to not have experience, there are avenues for increasing your credibility. A benefit of the widening weed industry is the proliferation of marijuana job certification programs and education courses. Sites like THC University are designed with the future of the cannabis industry in mind and work to prepare applicants for the work force. There are online and traditional courses for learning a wide variety of industry skills including cultivation, trimming and of course, budtending. Not every service is equally credible, however, so be sure to do some research before paying for training. If you don’t have a background working with cannabis and can’t utilize education resources, there is still hope! The importance of effective customer service for Seattle budtender jobs cannot be overstated. Presenting a proven history of effective service experience can make the difference between getting an interview or not. Work history at a coffee shop or bar proves that the applicant can learn information about a specific product and sell it to the customer with confidence. Having personally pursued numerous sectors of the marijuana industry, I can say with some confidence that it really helps to have friends in the industry. Before applying for Seattle budtender jobs, consider the relationship you have with the dispensary you’re applying to and the people that work there. While there is no guarantee that being friendly with your local dispensary receptionist or budtender will help you secure a job, it helps to give you some validity as an applicant. If you really want to get a job–ask questions! Politely inquire with your neighborhood dispensary staff about any suggestions they may have about finding a position, or what protocol they suggest following when applying. Use their industry experience as an asset in strengthening your chances. Aside from working with weed all day, what makes a budtender job worth the energy? We’ve explored how competitive the job market is, what the position entails and what employers are looking for, but you may be thinking: Is it worth it? Compensation for Seattle budtender jobs naturally ranges from store to store. As this position is viewed as somewhat “entry level,” the hourly rate for working behind the counter is less than, say, a managerial position. However, as far as service jobs go, the payout can be sizable. A working average for budtender pay ranges from about 12-16 dollars per hour, including tips. One of the primary benefits Seattle budtenders enjoy is a healthy employee discount on cannabis products. For the enthusiastic stoner, this perk in itself is enough to motivate applicants. Additionally, budtenders enjoy being part of an expanding community of professional potheads who use their expertise and passion to create an open, supportive atmosphere between employees and patients. While Seattle budtender jobs do not allow cannabis use at work, employees no longer have to worry about concealing their marijuana habits and beliefs from their employers or co-workers. Especially in the case of medical patients working as budtenders, it comes as a huge sigh of relief to not worry about drug testing for THC that other jobs may require. Though budtenders may have less professional stock than a master grower or dispensary owner, budtending allows for future job mobility if accompanied by consistent work. Some Seattle budtender jobs end up turning into supervisor or managerial positions that come with significant pay raises. Seattle isn’t just a city for coffee lovers anymore. The cannabis industry has found a unique core for medical and personal marijuana use that contributes to local commerce and facilitates important discussion. Seattle budtender jobs may be tricky to acquire, but they represent a growing faction of compassionate, politically minded individuals looking to transfer a love of cannabis into a professional career. As the country continues to shift into a less stigmatic mindset, the opportunity for growth in the marijuana industry is boundless.